Imagine if you were a senior citizen in a nursing home and NO friends or relatives ever came to visit you…not even for holidays. Neighbor Love, a ministry of E CUBED International, wants to brighten the day of a WHOLE BUNCH of valuable seniors. Adopt-a-Senior for Father’s Day is a GREAT way to let a valuable senior know that someone still loves them. E Cubed International is hosting a Father’s Day party and is giving gift bags to seniors at four nursing homes in Metro Atlanta. At the party, Barberito’s Mexican of Roswell they'll be supplying a taco buffet for the men to enjoy! The gift bags will include: shaving cream, socks, a carnation, a hand-made Father’s Day Card, and a puzzle book. 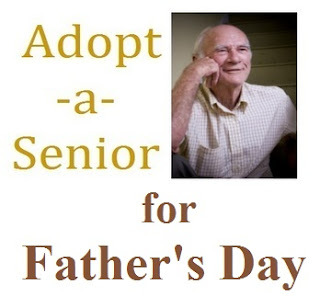 (exact contents of gift bag are subject to change according to availability of merchandise and the amount of donations received) The sponsorship to Adopt-a-Senior for Father’s Day is just $20 per gift bag. You can sponsor as many seniors as you would like. A donation of ANY amount is appreciated. Visit: www.adoptasenior.net to donate and volunteer. DEADLINE to Adopt-a-Senior for Father’s Day is Saturday, June 15th.